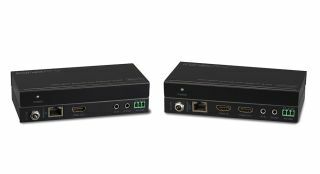 The What: KanexPro will showcase the HDMI 150m Extender over HDBaseT with loop-out at the upcoming Digital Signage Expo in Las Vegas, March 27 to 29, in booth 2363. The What Else: The EXT-HDBT150M is a transmitter-receiver set that extends 1080p60 HD signals up to 492 feet (150 meters) over single Cat-6 cable using HDBaseT technology. It supports HDCP 1.4 with EDID pass-through. The extender supports PoE (power over Ethernet) and requires power from either the sender or receiver side. Locking power supplies provide flexibility and secures HDMI cables in place to eliminate intermittent signal loss or disconnected HDMI cables. For control, the extender offers IR support and RS-232C for bi-directional control of devices to and from the extender. Cat-5e/6 cable with low impedance (shielded twisted pair is recommended with proper grounding). “We are continually refining our technology to meet the evolving needs of both our integrators and end users in the most effective, affordable, and practical way,” said Kashyap Khetia, product marketing manager for KanexPro. The Bottom Line: The EXT-HDBT150M is particularly suited for worship centers, conference rooms, lecture halls, or other large-scale settings where HDMI signals must be transmitted from computers to remote displays at a distance.